This salad is a full meal and then some, with generous portions packed with a bunch of our favorite nutritional heavy hitters. 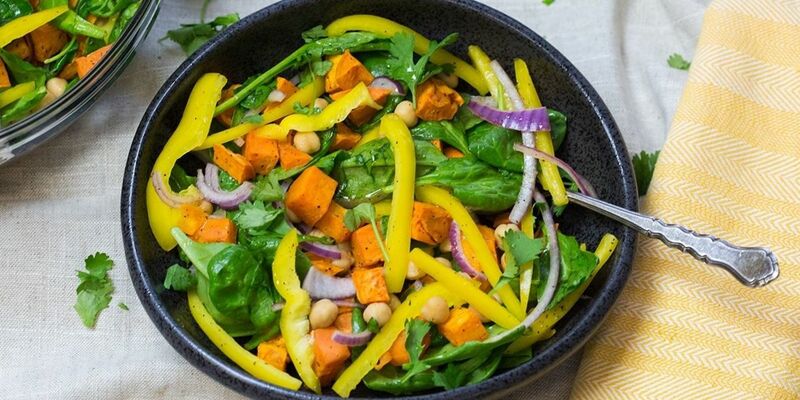 Sweet potatoes and bell peppers are rich in vitamins, chickpeas are high in protein and fiber, and spinach has loads of minerals. Add to that a sweet, spiced vinaigrette with garam masala and date syrup, a little fresh cilantro, and a squeeze of lemon and you’ll be feeling supercharged! Preheat your oven to 425 °F. Peel and dice the sweet potato. On a baking sheet, toss the diced sweet potato with 2 tsp olive oil and a pinch of salt and pepper. Place the baking sheet on the middle rack of the oven, and bake until lightly browned and tender, about 15 to 20 minutes. Rinse, deseed, and thinly slice the bell pepper. Peel and thinly slice the onion. Rinse the spinach. Put the bell pepper, onion, and spinach in a large bowl. Drain and rinse the garbanzo beans. Add them to the large bowl with the other vegetables. Rinse and halve the lemon. In a small bowl, combine the date syrup, dijon mustard, juice of half the lemon, garam masala, two pinches of salt, and one pinch of pepper. Whisk in 1 tsp olive oil until all of the ingredients are combined and the dressing is smooth. Add the dressing to the vegetables in the large bowl, and toss everything together to evenly coat. Add the baked sweet potato, season to taste with salt and pepper, and toss again. Rinse and dry the cilantro. Remove the leaves from the tough stems. Discard the stems. Serve the sweet potato and chickpea salad in large shallow bowls, garnished with the cilantro leaves. Enjoy!